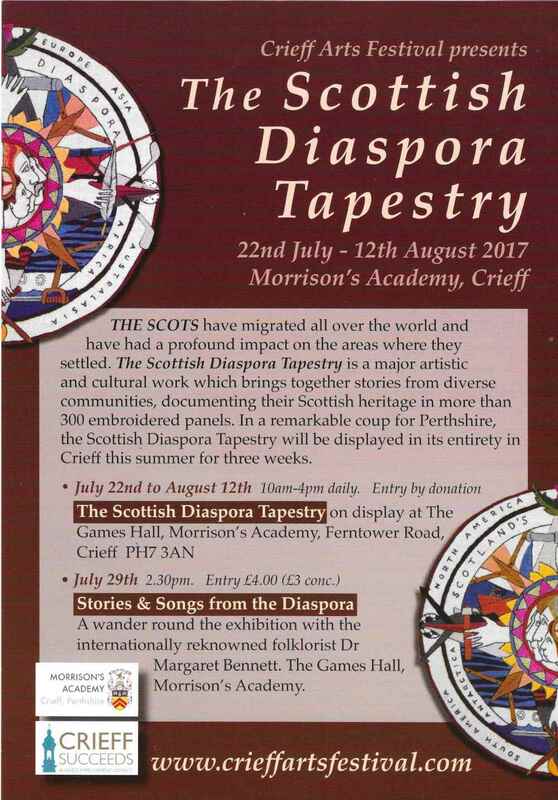 The Scottish Diaspora Tapestry is currently exhibiting in Crieff as part of the 2017 Crieff Arts Festival in partnership with Crieff Remembers. This fascinating work of art which tells the tales of Scot’s accomplishments across the world can be seen daily from 10-4pm at The Games Hall, Morrison’s Academy, free of charge up until this coming Saturday 12 August. The Scottish Diaspora Tapestry currently features 305 different panels, this extraordinary project will include 329 on completion, 5 more will be added telling Icelandic stories when the exhibition moves there in January 2018, and the remaining 19 are underway. 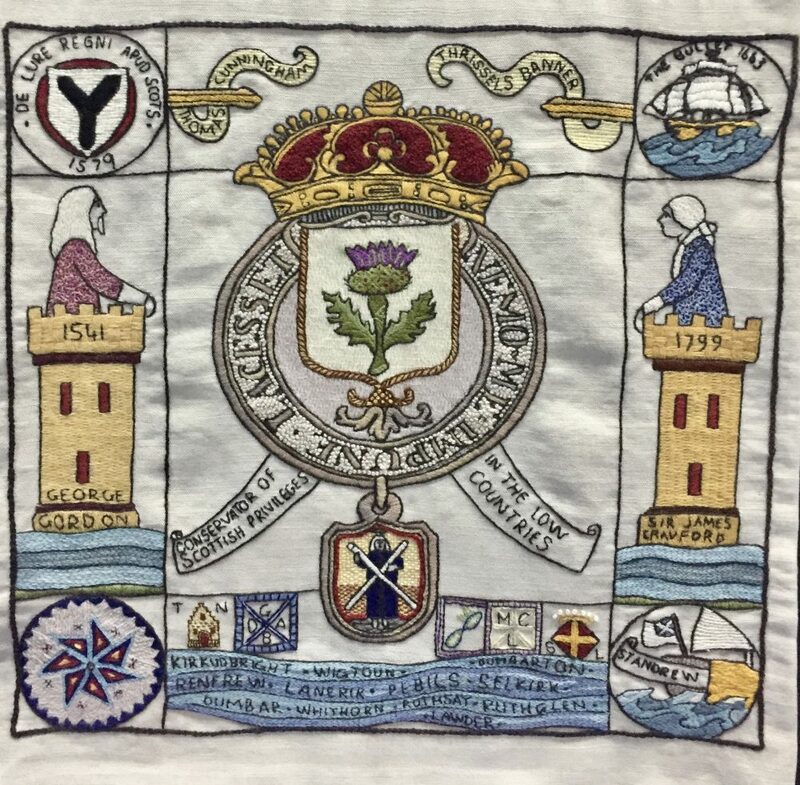 The Scottish Diaspora Tapestry is a successor to The Prestonpans Tapestry and has been developed alongside its well-known cousin The Great Tapestry of Scotland. This project has involved communities around the world in celebration of Scottish heritage and culture, the people and places which connect Scotland to its global diaspora. Community groups, made up of both experienced and novice embroiderers, have volunteered to help stitch the tapestry and were in contact with the artist Andrew Crummy with their ideas as to what would best represent their area. Andrew Crummy then drew up each panel which was returned with a variety of Coats threads and the book The Art of Narrative Embroidery as a guide to create the panels. The main design was created by artist Andrew Crummy, however, decisions as to how to stitch the design and any additional imagery were left with the embroiderers themselves. The quality of the work is incredible and the impact of seeing the panels together is both beautiful and eye catching whilst also being highly informative and fascinating, history story telling in stitch! 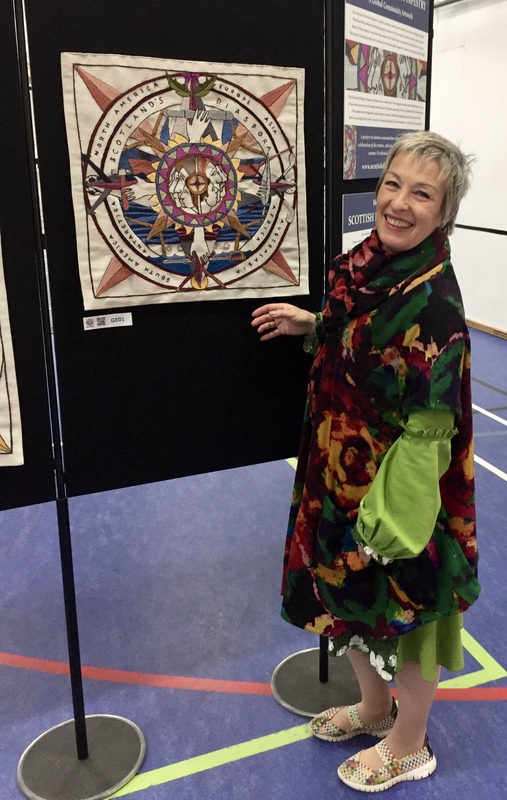 Bringing the Scottish Diaspora Tapestry to Crieff has been 2 years in the planning and thanks to the tireless work of Crieff artist and Crieff Arts Festival organiser, June McEwan. You can read the full story of The Scottish Diaspora Tapestry being in Crieff on this link on the Scottish Diaspora website. The event has been supported by Crieff BID and Morrison’s Academy. There’s also a free Scottish Diaspora App which can be used alongside each panel to find out, even more, detail about each design, full details can be found on the Scottish Diaspora Tapestry website. Organisers are delighted to have on display, the returned panel which was stolen whilst exhibiting at St Giles Cathedral in Edinburgh. The exhibition has received a great deal of interest with over 100+ visitors each day and well worth a visit. On until Saturday 12 August, open daily with free entry (donations welcome), 10-4pm at The Games Hall, Morrisons Academy, Ferntower Road, Crieff, PH7 3AN.